AccuSensor 910 Series - The 910 tab type electrode is an economical solution for resting procedures. The silver/silver chloride composition provides optimumperformance. Resting Tab & Snap Electrodes can be found in our extensive online collection of products from globally recognized and trusted brands, including Conmed. 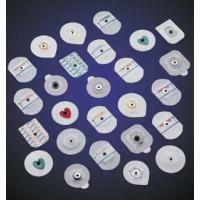 An excellent option to consider is the Electrode Resting EKG AccuSensor Gel Tab Style 1000/Bx.